The Newcastle United Blog | » Newcastle Too Late For Stephen Appiah? Newcastle Too Late For Stephen Appiah? 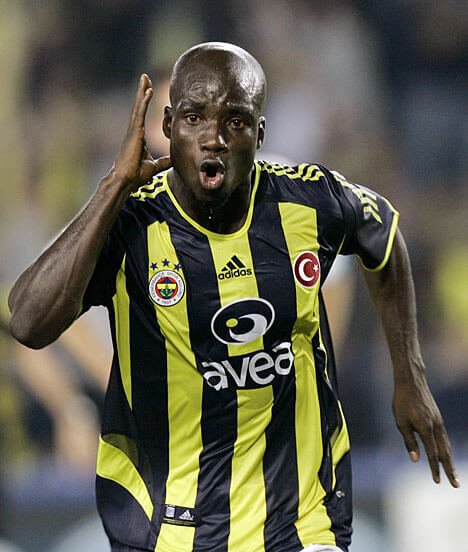 One player we are hopefully pursuing with some urgency is 27 year old Ghana captain Stephen Appiah, who has been a free agent since he left his last club Fenerbahce, in August. And of course Stephen has been linked with a number of clubs since then, and he will be playing for Ghana tonight in a friendly against Tunisia – when a host of clubs, including Newcastle, will be checking on him. With Newcastle short of midfielders and Barton now injured and out for 8 weeks we need a strong midfielder like Stephen, who would cost us nothing. It’s a bit of a surprise to us that we haven’t checked him out earlier, when Kinnear said he had checked out all the free agents and nobody suitable was found from those ranks. Stephen earned the nickname of Tornado, simply because he is dominant in midfield and a very strong player. A combative player, Appiah has a strong engine and good tactical awareness, and is a good all-round box-to-box midfielder, who is able to defend as well as create and score goals. Doesn’t this sound like a player we need at Newcastle? And his transfer price is also good – nothing. He’s played 53 times for Ghana and scored 13 goals, and previously played for Juventus, Brescia (loan), Parma and Udinese before signing for Fenerbahce in 2005. But we may be too late now that other clubs are after him. Why we haven’t been after Stephen over the last few months is a mystery to us. No truth in this just the same 3 guys on this blog who’ve been saying we should get him for the last 3 month. i hope we get him! PLEASE! He’s a very good player; nobody can question that. However the injuries he’s had are a major putoff to clubs. If he could prove his fitness then he’d be worth a contract to the end of the season with additional year(s) if he proves his fitness and form during that period. He may be holding out for a silly salary, as a lot of free agents do. Given our need to cut the wage bill, this may be a factor – along with that injury record. The last thing we need is another perpetual crock taking £80k a week for nowt. Xisco Stu’s idea of a contract to the end of the season with an extension is probably best. look at this lads! whats going on at our club? grr! i,ve watched stephen many times,and i rate him. but you have to ask the question of why he cannot find a club? newcastle club statements from this era will be sought after on the antiques road show in years to come. It boils down to(as always) the money. We all know the policy in place, so forget about it. Even though we desperately need someone of his caliber to survive. And dont start getting your hopes up about new signings of any substance during the upcoming window, it appears MA is more interested in asset stripping than adding to the pay roll. A foolish policy that he will come to regret if the sale of the club does`nt go through, which at this time does`nt look that likely. lets get him. simple as. Enrique would be on there but i beleive he’ll improve even if we get Warnock! Sadly, not even this will happen. Its a sad state of affairs when your club isnt organised enough to sign a free agent. if we sell those it will give us some money and we still have money from the Milner sale! I’ve been going on about him since mid-summer, and as recently as a couple of days ago I was saying he is a must-signing. Where else do you get that sort of quality, experience, physical ability, hard work, good distribution and ability to dominate the engine-room? And for free?? Yes his wages will be pretty big (read: similar to Barton’s) but he is worth it. Bring him in! Too early to say sell Xisco, surely? I am not in the camp that thinks he should be starting and stuff right now, but I think he has really good potential; tall, pretty skillful, pretty fast and has a decent goal-scoring record. People at Deportivo were very sad to see him go. I would see keep him around. Typical useless management, Kinnear and Wise should have had him on the radar but apparently have been asleep at the wheel. Do you remember Gary Speeds 1st season? he was awful and the next he was a star player! Thats why i’m saying keep Smith! We will probably be Vidukas last club so we can let him retire here and pass on his knowledge to the club, the only reason i’m saying keep him is he is a good player but he can also help Ameobi! I still think Duff has at least 5 years left of football and he will come good! We should take a chance on him because he is quality when fit. If we have little money in Jan we could get Binya from Benfic for about a mil. The referee’s a catholic! Get him out of here. p.s this is a warning message to the ref, anyone else needn’t worry, although you may worry if you want to. If all of the players you have mentioned are as good as you claim and available for the low amounts you quote. The tell me how come they have`nt been snapped up by bigger clubs. Are you suggesting you are a better judge of talent than the proffessional scouts employed by Europes best cubs. Or is it only a hobby and opinions? Definitely worth a shot. When he is fit he is a fantastic player! Where did this come from like Ed, you bored or something??? No doubt, and as everyone who has seen him play has said, he is a great player, and at nowt, would be a decent bit of business!!! But as you said Ed, free agent since august….and you think we will go for him now because??…..???? Just a bit too far into the realms of fantasy for me, the club has openly stated it youth policy, as well as taking into account the small issue of being in administrative turmoil, this wont be happening!!! The only thing that WILL be happening on the player front from now until Jan (or when we know until JFK will be in charge) is the scouting and the hopeful recruitment of young players. Carry on I say to Mr Wise! ed the unwashed arnt rich enough to shop there. good piont, Hitman. By the way, you are an outstanding film, and jason statnton is awesome in you. I toast to your film making skills, you are an honer to your country. jonas just had an assist for argentina! lol Ed Speed you crack me up..Good to have a jester in these troubled times. My only problem with this ‘why doesn’t he have a club already’ which must point to fitness issues. So i would say get him in on say 10k a week basic and massive appearance bonuses (improved play as you play). If he can prove his fitness then award him with a full contract in the summer. Hopefully by this stage we will have been sold and the owners will want to buy even better players! What ones did I say would be cheap. Binya would be cheap as he is 3rd back-up at Benfica and a good player, i never said e was brilliant. Would anyone on here be interested in buying an original match worn HSV Hamburg, signed Kevin Keegan shirt? I am looking to sell but ideally I would like the shirt to go to a geordie who will look after it like I have as this is very rare and special shirt…Anyone? Just seen the argentina goal. brilliant little lay off from gutierrez in the box for rodriguez. cool touch and just a touch on, great goal. How did you get that? and what sort of money are you looking at for it? Just for anyone who cares, Ireland are behind 1-0 at half time. Shocking defence, nothing Shay could do, it was a good header..appauling defending though. Given didn’t look to pleased. LOL!! Folan and O Shea just looked at eachother. But Given’s made a decent save but other then that has had nothing much to do, Ireland really should be ahead, which brings me to the next point..Duff. Eh, he’s missed a few wee sitters. There’s calls for him to be taken off. He’s a wee bit shocking to be honest. Hopefully they’ll turn it around though. Doyle’s set Duff up a good few times but nothings come of it, hopefully that’ll be solved at half time.